Your hosts are long time locals to Alaska’s southeast region. Born and raised in Skagway, Fred grew up at his father’s sawmill on the Chilkoot Trail. 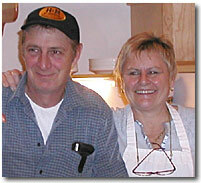 His wife, Kathy and her family came up to Alaska on a fishing boat in the 60’s and have lived there ever since. Their children, Desi and Eric, are Alaska born and raised and are also active in the operation of the Chilkoot Trail Outpost. As life long local residents, the Hosfords can offer you stories of the area’s rich history, and provide you with a taste of their rich-Alaskan culture.